A vehicle sales agreement is a legal document. It comes into action when a person is selling his/her vehicle to another individual. All the terms and conditions of the deal are listed and described in the sales agreement form. The form also consists of the detailed description of the particular vehicle, the details of the payment status, the delivery details and so on. 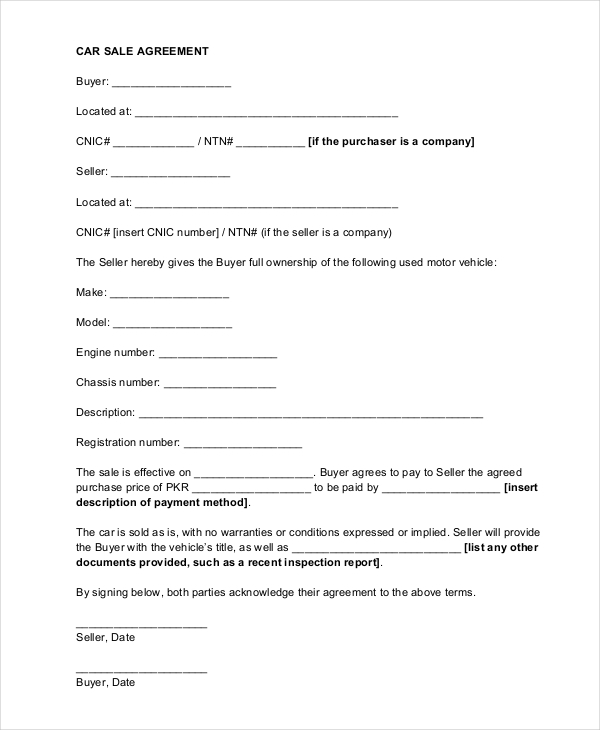 Both the parties (seller and buyer) are supposed to sign the form in order to proceed to confirm the deal. 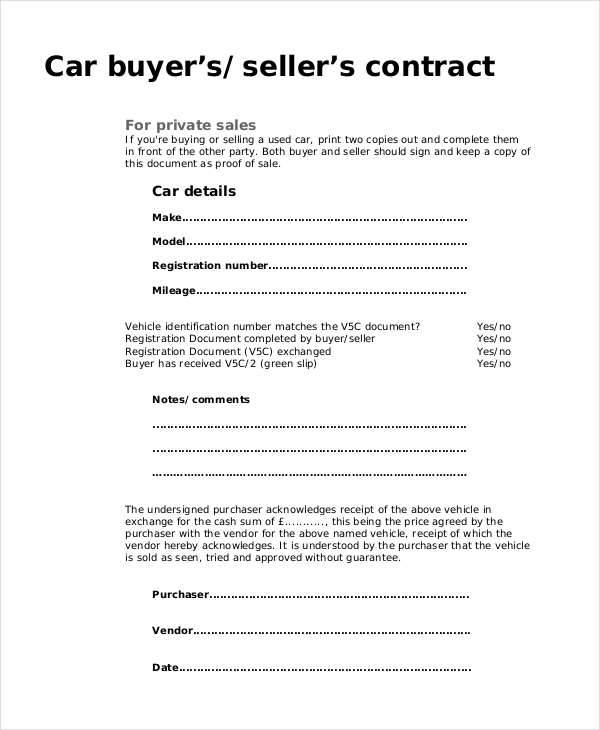 this form is regarded as the contract for selling a vehicle. The form contains the name and address of both the parties (seller and buyer). Other than that, the form also contains all the information about the car such as the type, model number, color, year of manufacturing, engine number and so on. The form also contains the information of the payment details. After getting the full payment, the seller agrees to hand over the vehicle to the client. The form also conveys all the responsibilities of the seller. Both the buyer and the seller have to sign this legal contract. 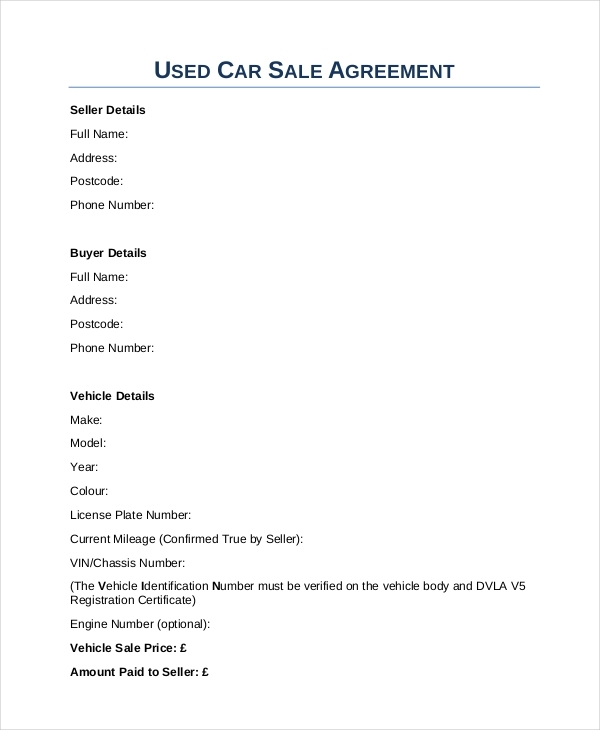 This document is important for both the seller and the purchaser because the form contains all the essential information such as the car’s model number, registration number, the mileage and so on. The form also consists of the payment details and the details of the seller. Other than that, the form also contains the details of the buyer. As similar to the other forms, this contract also needs to be signed up by both the parties. This contract is particularly used for selling and purchasing second-hand cars. This form consists of important notes for both the buyers and sellers. By reading the full contract, the seller comes to know if he/she needs to provide any inspection report. The seller also has to confirm the fact that the buyer is an adult and he/she has the full legal capacity. Both the parties need to provide certain personal information related to the deal, in this contract. If you are selling or buying a used car, you have to fill out the used car sale agreement. The legal document contains the personal details of the seller and the buyer. Other than that, it also contains the details of the car such as the model number, color, and license plate number and so on. 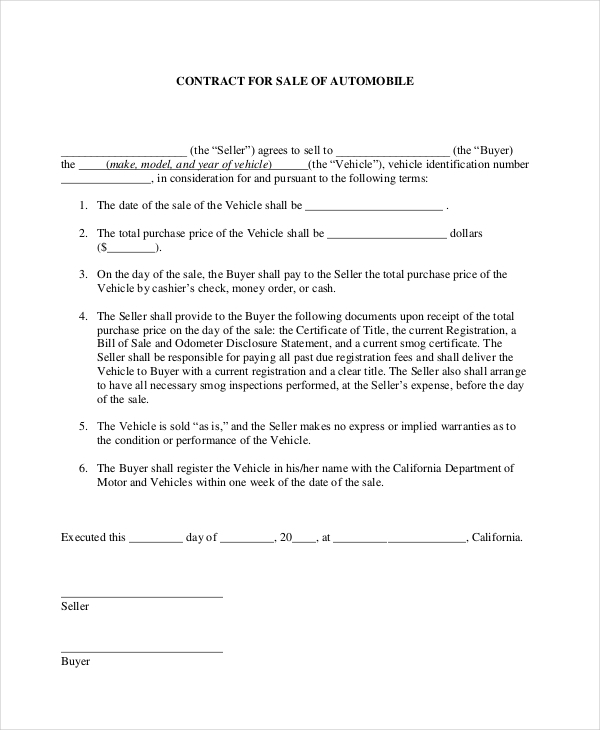 The seller has to sign the document as the legal owner of the vehicle. The buyer needs to sign the form after making the full payment. A seller of a vehicle can give the purchaser the complete ownership of the particular vehicle by filling out and signing up the car sale contract legal form. The form contains the names and addresses of the seller and the buyer. This form consists of certain terms and conditions related to the deal. By signing this form both the parties confirm their agreement. This form is used at the time of private deals of vehicles. 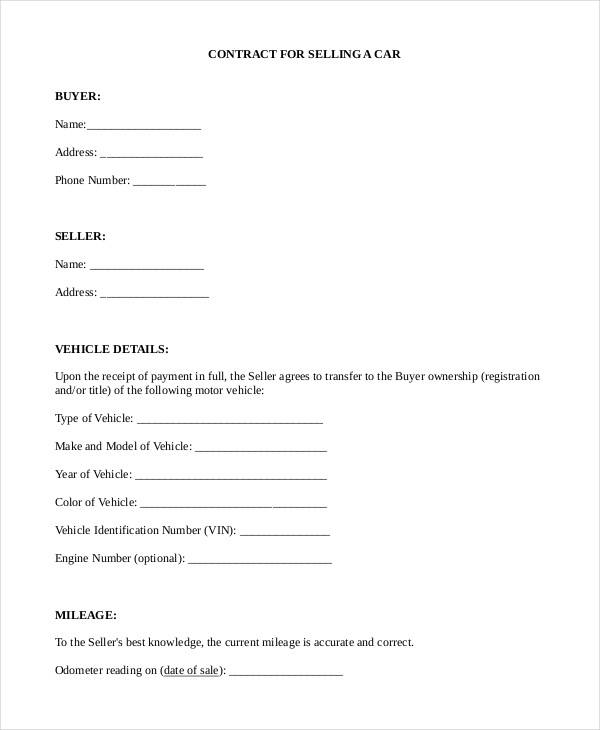 If you are about to sell or buy a used car, you need to print several copies and fill out these in front of the other party. Both the parties need to sign the copy in order to go ahead with the deal. Both of them also need to keep a copy of this document as an evidence of the deal. The contract also contains the details of the vehicle. The seller of a vehicle conveys his/her approval to make the deal with the buyer, through the contract for the sale of an automobile. The legal contract needs to contain the exact date of the vehicle, the total amount of the money which the buyer has to pay and so on. The contract also conveys that the buyer needs to pay the money by money order, cashier’s check or cash. The form also includes the fact that the seller has to deliver the car to the buyer with a clear title and a current registration. 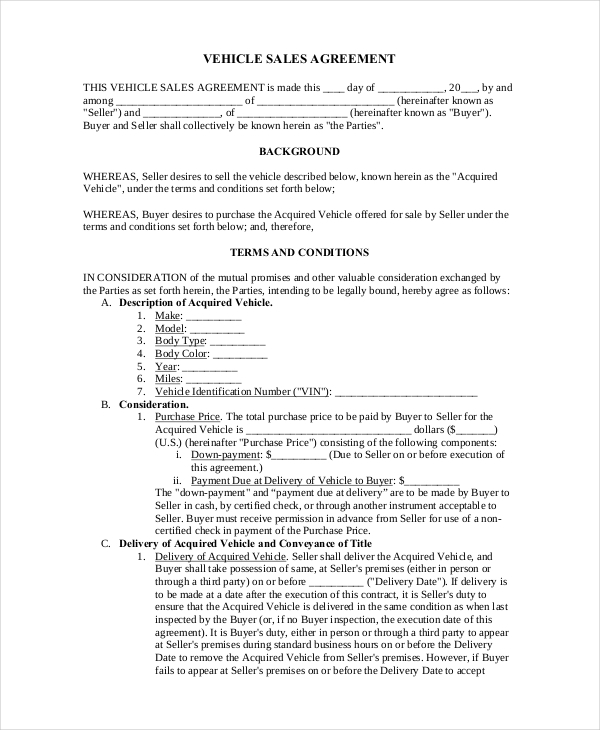 What is The Need of a Car Sale Contract Form? If you are selling a used car privately, you must provide the purchaser with a receipt of ‘used and approved’. The car sale contract is used as the receipt which convinces the buyer that he/she is making an authentic deal. As a seller, you also need to make sure that the vehicle must match all the descriptions which are written in the contract. You cannot provide the buyer with any wrong information of the car. Providing the buyer with a false contract will affect his/ her legal right. The buyer needs to confirm all the important facts related to the deal. That is why both of you must use the car sale contract form as the legal evidence of the deal. What are The Essential Tips for The Buyers of Cars? If you are going to buy a new or a used vehicle, you must take care of certain issues related to signing the car sale contract. 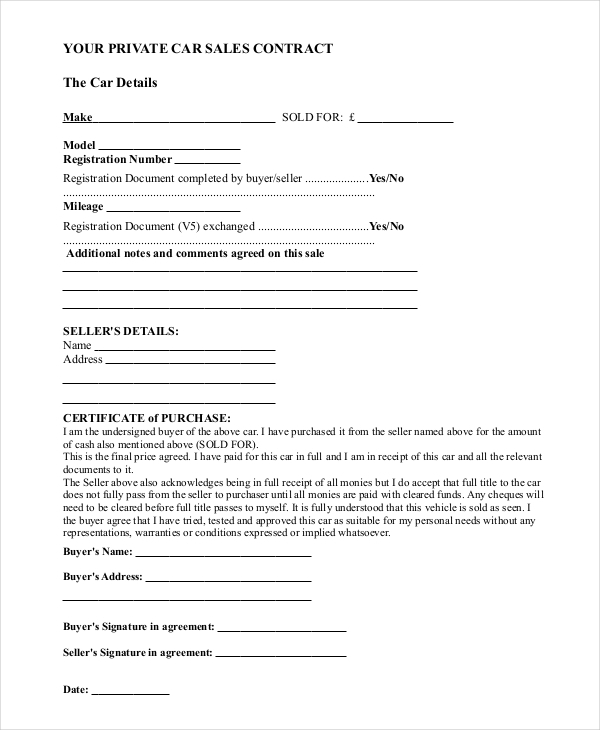 Keep in mind that the car sale contract form is a legal document. As a buyer, you must not sign the contract until you are sure that you are going to make the purchase. As a buyer, you have to make sure that the car sale contract does not contain any terms, conditions or clauses that you do not approve. You also have to check out whether the legal contract conveys the trade in amount or not. The car, you are going to purchase, must have a particular delivery date. You should never sign an incomplete contract when it comes to purchasing a vehicle. You must keep a copy of the document that you have signed as the contract of the car deal. The legal systems automatically provide you with all the legal rights over the goods or services after paying for them. Make sure you know about all the consumer warranties and guarantees. There was a time when the car sellers and buyers used to search for the forms of the car sale contracts across the market. But, in this modern era of digitalization and internet marketing, everyone can easily get these forms on the internet. 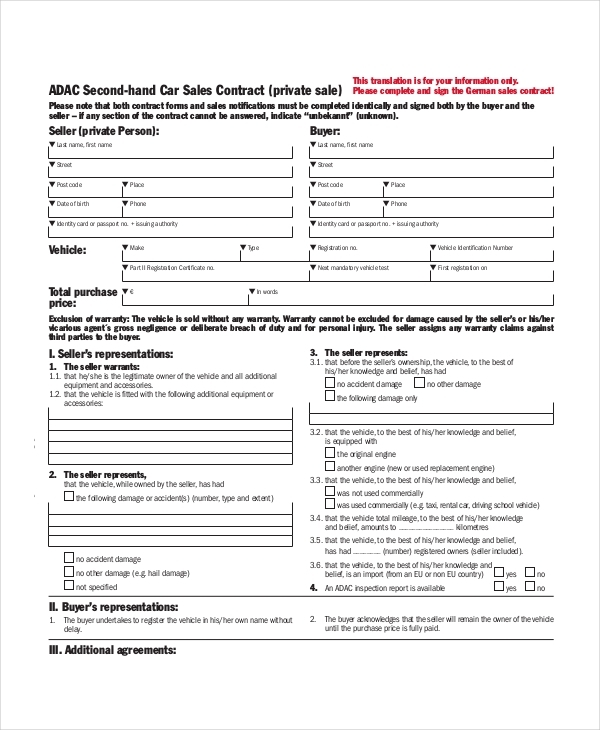 You can simply download these car sale contract forms from our website. Such online versions of the forms are entirely error-free. These forms are available both in the word doc or PDF versions. You can even modify the forms if you need to. If you need any help regarding editing and revamping the forms, you can always seek help from us. We would be happy to help you. You can even print the forms from our website.